Congratulations to the 2010 Stockton 99 Champions! Starter Mark Vincelet waves the green flag Saturday for the first Pro-4 Modifieds heat during Stockton 99 Speedway's season opener. rewarded with sunshine to go along with seeing their first checkered flags of the season. "I can see how (racing) can be very addicting," Melissa Ranz of Denver said at her first racing event. "I think it's pretty interesting to see how everything goes. It's very thrilling to watch. 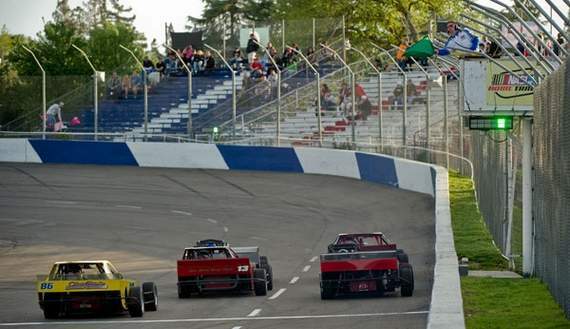 The turnout was estimated at 1,000 by track officials for the soft opener - there were no NASCAR sponsored events this week - speedway promoter Tony Noceti was encouraged by the number of cars competing on the quarter-mile track. "We think the nice weather had a lot of people getting out to do something else outdoors this weekend, but I guarantee you'll see 3,000-4,000 people out to see the late models next weekend," said Noceti. "They had better be here early." Noceti said the speedway will host fewer races this year. "We're cutting back so people can afford it in this economy," he said. "We've got a lot of positive feedback from the drivers, so I'm looking forward to a good season." Several young fans dotted the stands, some racing their toy cars along the bleachers during qualifying rounds. "I've been out a few times and I've brought the boys," said Bryant Lucot of Stockton, who brought sons Bryant and George along with his father, Jim. "They've really been into racing after watching the movie 'Cars.' 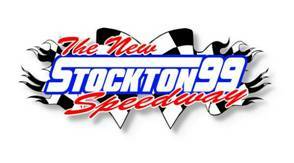 "
Speedway announcer Wayne Pierce said he was eager to see the new season get underway. "It's good to be back here in Stockton," Pierce said. "What I really get a kick out of is seeing the third generation of racers out here. You see some of the same family names over the years like the Bellettos, Strmiskas, Knittels and Philpotts, to name a few." In the Legends main event, James Bickford was the youngest driver at 13, while Bob Kuebler was the veteran at 68. Joseph Reichmuth overcame a bump and spin that momentarily put him on the infield grass to win the B-4 main event. Mike Graham took advantage of his pole position in the Super Stocks to win the main event. Jessica Walker won the Legends four-lap trophy dash, Matt Anderson won the B-4 dash, Garland Tyler won the Super Stocks dash, while Greg Van Cleave was a double winner in the Pro-4 Modifieds main event and dash. Robby Czub won a crash-filled Legends main event. Jason Aguirre won the second Super Stock main event. Results for the 199-lap Enduro Series main event were unavailable at press time.